My team and I enjoy working on projects of all sizes from large whole-house commissions to consultancy over single rooms, a piece of furniture or a pair of curtains. In all cases the intent remains the same: we are passionate about saving you time, removing stress and uncertainty, and presenting beautiful results. Working collaboratively with our clients, our aim is to create spaces and rooms which provide pleasure and enjoyment for years to come, whether you're relaxing, working or entertaining. Our design services are personal, comprehensive and flexible. Contact me today to tell me about your project! Drawing on over 20 years’ experience in the commercial, development and private sectors of London and the north of England, Built By Blackwell was created to provide high-quality tailored build and design services to private and corporate clients in Edinburgh. Built By Blackwell understands the complexities involved in completing a project on time and within budget. With the support of an efficient and professional office, we are well-equipped to meet all the challenges involved. Quality and professionalism form the core of all our work. Our mission is simple yet has taken many years of experience to perfect: to provide a thorough, honest, well-managed and competitively priced service to our clients, whilst delivering a quality product. We offer home refurbishments to renovations, extensions to bespoke creations. We design beautiful interior and exterior spaces to meet your vision. Each client is unique, and we tailor our service to work closely with individual specifications and goals to achieve a high-quality finish. You can rest assured your project is in good hands. Following a lifelong obsession with interiors, years of up-cycling & property development, Cathy retrained and made her passion her business. Beautiful design should also be functional, understanding how you live in a space is key. A home that looks beautiful but does not fulfil your needs is a daily frustration. My work focuses around spacial planning making spaces easy to live whilst also being aesthetically pleasing. Work featured in titles such as House Beautiful, Ideal Home & 25 Beautiful Homes. 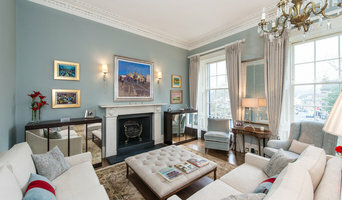 An interior design practice based in Edinburgh. Rachel Richmond (BA Hons), Director, set up Hen & Crask in 2015, having been Director for another company for 7 years. Rachel has a Silver rating in the House & Garden Designer Directory "The List" www.houseandgarden.co.uk/the-list/scotland-area. 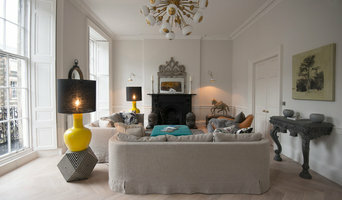 Her work has featured in Good Homes, Scottish Field, Scottish Homes & Interiors and The Telegraph magazine. Luxury interior design for kitchens, bedrooms, and living spaces. Established for over 30 years, Cameron Interiors is renowned for a product that is second to none. Owned and managed by Kirsten and Ian Robeson and driven by their passion for innovative design, Cameron Interiors has earned a reputation amongst its clients and contemporaries as purveyors of professional and personal luxury interior design which recognises the value of client involvement at every stage. 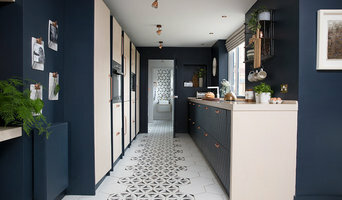 From the design studio in Glasgow and an exclusive bulthaup kitchen studio in Edinburgh’s New Town, our expert consultants provide design and project management for all aspects of the interior creation of kitchen, bedroom and living storage. Bulthaup, our furniture brand, is a product renowned worldwide for its architecture of living spaces. Innovation, precision and stunning aesthetics are characteristic of the brand. For Bulthaup, precision means superlative expertise and quality as well as technical perfection - all qualities that Cameron Interiors emulate. As a studio we design with people in mind with the focus being on what feels right for you. We create interiors that are both beautiful and functional, meticulous in detail and able to promote the feelings of being at the right place. We believe in the phrase “Less is more” and think liveable luxury is essential. Arosfa Interior Design is a luxury interior designer based in Edinburgh offering a highly personalised service led by Rhian Davidson (BSc Interior Design). Our homes are a place for us to relax and escape from the outside world; they function to our lifestyle and suit our needs, and we are happier when we are surrounded by things that resonate with us. Arosfa take time to try to discover what these “things” are and skillfully captures them in every interior. We take pride in creating interiors that compliment the clients’ personality and lifestyle. Drawing on our design flair, imaginative approach and product knowledge, we are able to design a home that is stylish, compliments the period/style of the property but most importantly is as individual as you are. Aside from the creative process, Arosfa Interior Design also understands the importance of spacial requirements and we carefully consider how each room is going to be used. In addition to looking visually pleasing, the interior needs to be practical and address the functionality of the space. Since establishing the business in 2012, Arosfa interior design have completed a wide range of interior projects from enhancing elements of one room within a property to managing a larger scale budget for a new house renovation. We strive for excellence and complete customer satisfaction. I’m Tracey Bloxham and I have a passion for interior, architectural and food photography. My images are used by estate agents, holiday cottage agencies and owners, businesses large and small along with hotels, restaurants and architects and developers. I’m based in Northumberland and I have been photographing properties in Northern England and Scotland for over 10 years now. Recent clients include Rettie estate agents, Large Holiday Houses, Crabtree & Crabtree, Roxburgh Estates, Susan Reid Collection, Galloway House Estates, Monzie Castle Estates, Cottages in Northumberland, Stay Northumbria, GH Catering, Lucre PR agency, Highland Escapes, Beaver Furniture, Super Control, The Calvert Trust and Porter Novelli PR. My work regularly appears in various property magazines and in the national press. With over 35 years of shared experience Adam Peden & Camilla Pringle can carry out a wide range of Interior projects from small to large, traditional to contemporary. Peden & Pringle Ltd is dedicated to the individual client's requirements with attention to detail & customer care at the forefront. Kitchen design & project management is a speciality. I'm a freelance interiors writer. I source and write articles about people's homes and self-catering properties which are then published in magazines and newspapers such as Scottish Field, Scotland on Sunday, 25 Beautiful Homes, Build It, Ideal Home etc. I also do PR and marketing for interior and property specialists. I'm always on the lookout for interesting properties, so if you have one in Scotland, please get in touch. Beacham Architects is an innovative design studio, offering full architectural and interior design for your home. We're a design- led team, specialising in new-build houses, extensions, loft conversions and basements to enable you to make the most of your whole home. No home or family is the same, so we carefully tailor our services to you. We're also committed to delivering excellent design and using top quality materials. We believe in using natural materials and designing sustainable homes for comfort and energy efficiency. Our designs are intended to fit seamlessly with their surroundings and blur the boundary between inside and out. Features like window seats, functional joinery walls and mezzanine levels add interest & ensure your space suits your lifestyle. Good design improves lives and adds value, just ask our clients. Our extended team includes expert ARB registered architects, interior designers, structural engineers and party wall surveyors so you can rest assured you're in safe hands throughout your project. Call us today to discuss your ideas. Zögern Sie nicht, die Hilfe von Profis zu suchen – jedes Bauprojekt kann Sie teuer zu stehen kommen, wenn es unsachgemäß ausgeführt wird. Besonders wichtig ist die Planung der Kosten. Professionelle Anbieter kennen die Abläufe, helfen bei der Kalkulation und behalten die Kosten im Blick. Vermeiden Sie unnötige Kosten oder Verzögerungen. Engagieren Sie lieber Experten - egal, ob es um einen Umbau, die Modernisierung Ihrer Einrichtung oder die Sanierung von Wohnräumen in Heriot, Scottish Borders, UK geht. Ihnen gefällt der Umbau oder das Haus eines befreundeten Paares? Fragen Sie in Ihrem Freundeskreis, wer beim Renovieren oder Sanieren gute Erfahrungen mit Dienstleistern in Heriot, Scottish Borders, UK gemacht hat. Die Firmensuche von Houzz funktioniert nach diesem Prinzip: auf die Empfehlungen der Community können Sie sich verlassen – egal, ob Sie einen Innenarchitekten suchen oder einen Elektriker. Lesen Sie daher, welche Erfahrungen andere Houzzer mit einem Experten gemacht haben. 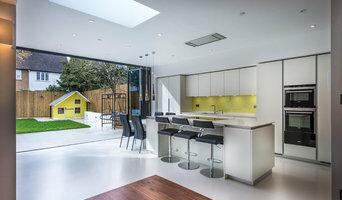 Bei Houzz präsentieren sich jede Menge Experten, darunter Architekten, Interior Designer und viele weitere Dienstleister für Haus und Garten. Mit unserer Expertensuche finden Sie die passende Firma für ihre Renovierung oder Sanierung in Heriot, Scottish Borders, UK online. Geben Sie einfach den gewünschten Service und Ihren Standort in das Suchfeld ein. Unternehmensbeschreibungen, Referenzen und die Erfahrungen anderer Kunden informieren Sie über die angebotenen Leistungen und den Ablauf einer Zusammenarbeit. Kontaktieren Sie Ihren Experten, um weitere Informationen zu erhalten oder eine Frage zu stellen.